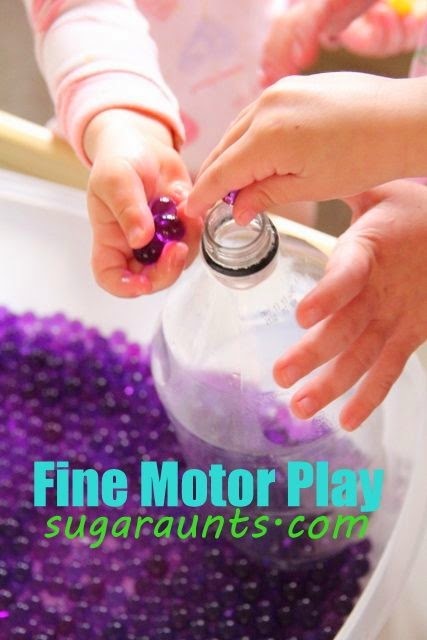 Kids just have no clue about the technical terms for the fine motor development that they go through. And that is normal and completely ok. Parents typically don't even know what exactly is happening when their child picks up a handful of coins and as they squirrel them away in their chubby little palm before dropping them one by one into a piggy bank. 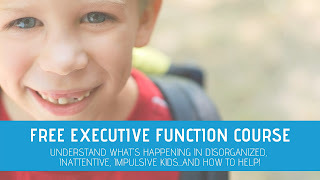 All that matters is that the child is manipulating items, working their fine motor development, and having fun. 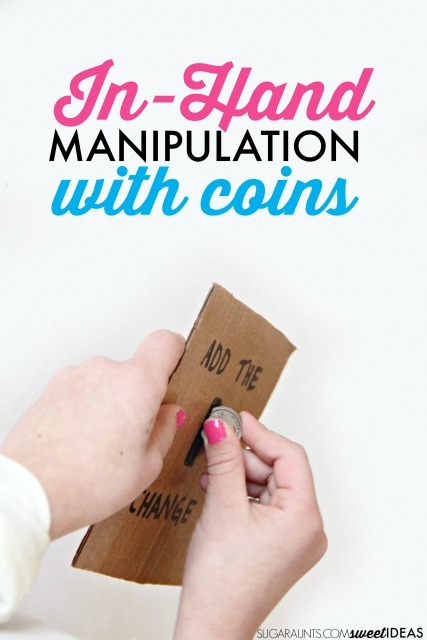 This in-hand manipulation activity meets the fun expectation and works on so many fine motor skills. We practiced letter identification and made the activity work for my Toddler, too. We came up with a similar idea a few months back. 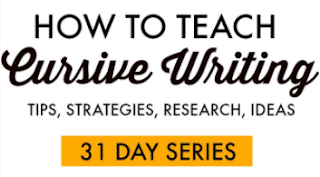 It worked for today's activity with a slight twist. 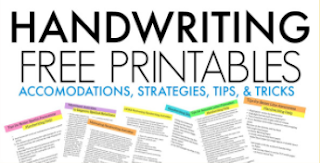 In-hand manipulation is a powerful fine motor skill that that kids use for tasks like manipulating a pencil in writing activities, managing buttons and zippers, manipulating shoe laces, and holding and managing small items such as coins or beads. 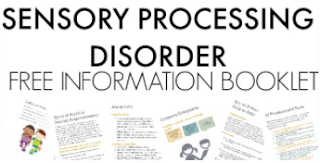 You can read much more about in-hand manipulation here. 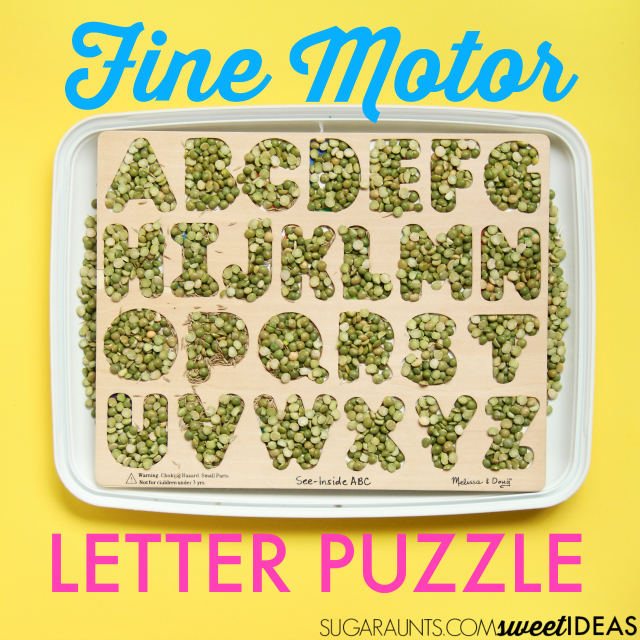 To use puzzles in a fine motor activity like this one, you'll need a small item such as dry split peas. Dry beans or field corn would also work for this type of activity. You'll also need a wooden puzzle with edges. For today's activity, we used a Melissa and Doug wooden See Inside puzzle. 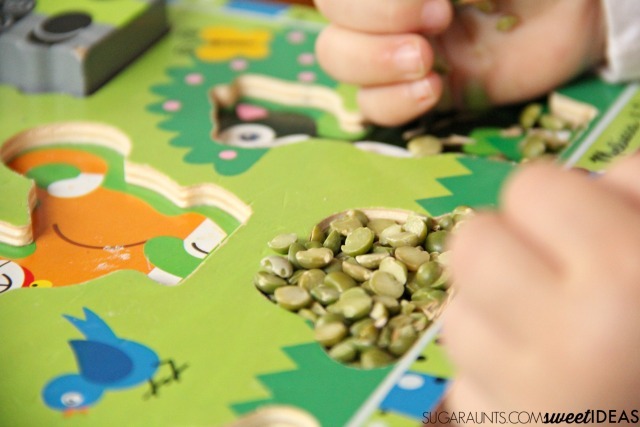 This was perfect for our activity because the pictures hidden behind the split peas played peek-a-boo with us as we added the peas. My preschooler worked on her in-hand manipulation skills to fill up the letters by naming the letters and filling the letter space in proper-ish letter formation. I tried to show her how to fill in the letters with dry peas in the same order she would use to write the letter. This worked for most of the letters. 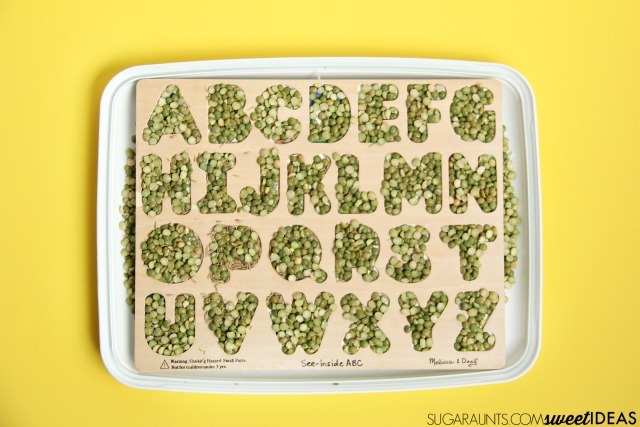 If you are working on letter formation with your little one, show them how to fill in the top of the letters as they sprinkle in the beans or peas a little at a time. 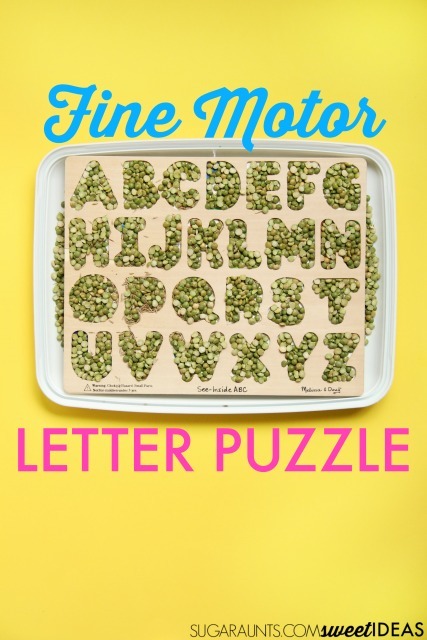 An upper and lower case letter puzzle would be great for older kids who are working on forming lower case letters. We did end up doing the same activity with my Toddler's chunky pets animal puzzle. 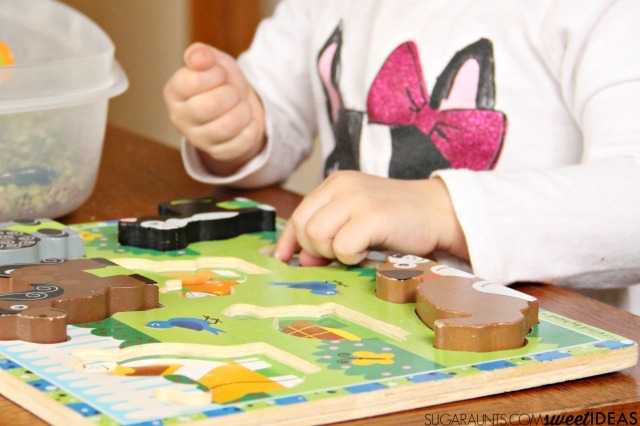 This graded activity was great for her in-hand manipulation development too and she got to work on animal identification and animal sounds as she filled up each animal space in the puzzle.